A: Murky, light amber color with less than one finger of diminishing white foam head. Moderate lacing remains on the glass. S: Chewy treacle and concentrated grape fruit preside over a bready foundation. Yeast influences practically disappear between the bread and dark fruit. Qualities are predictable in quality, but show considerable depth. No alcohol is detected. T: Begins sweet, with toasted malt and rich toffee. Acidity is high into the middle where flavor qualities become saccharine and very shallow. The finish is fairly bitter for the style, but with enough dark crystal roast and vanilla hints to redeem the profile. No alcohol is detected. M: Thick viscosity, acidic and slightly syrupy on the palate, with moderate carbonation. D/O: Aside from the pleasing and decadent smell, this strong ale underwhelms. The bottom seems to drop out of the flavor profile in the second act, which is unfortunate because up until that point the taste was fairly congruent (in a good way) with the smell. For the abv, a beer of this style ought to resonate with more consistent and interesting flavors. Aroma is dominated by raisin and prune. Flavor is more floral than expected, with lots of caramel malt to back it. Dark fruit complements. Aroma: a rich aroma of plums and bread malts. Taste and Mouth feel: plums, raisins and even some cherries with sweet malt, with a slightly dry finish. A smooth, medium bodied mouth feel. Drinkability: A very nice old ale. Pours 1 finger of creamy beige head. Decent retention leaving some lace rings. Color is a clear amber copper. Active carbonation in the class. Aroma: Lots of fresh bright fruits. Cherries, plums, raisins. Very sweet. Lots of malts here. Not very many hops present. Some caramel malt flavors. Not to mad, but not very warming like an old ale should be. Taste: Sweet and malty. Some nice fruit flavors blended with all the malts provide a good flavor. Cherries and raisins most apparent. Lots of malts. Bready and caramel flavors. Still, not very warming, but the alcohol shows. Mouthfeel: Creamy, fizzy, and smooth. Medium bodied with more carbonation than the style normally provides. Ends very dry and malty. Overall, this wasn't much of an old ale imho. It didn't have what I normally expect from a solid old ale. The carbonation was too high, providing a fizzy feel to it. The alcohol showed but not in a warming manner. It was malty like it should be, but lacked some essential components. A: Pours a deep amber red with a mild white head with good retention, no real lace. T: Big stone and dark fruit character, rum and orange there for sure with golden raisins and plums. Apricots come to mind as well. M: Full-bodied and robust, a big beer for sure. Light aftertaste of sweet true malt which I liked. D: A nice sipper on a cool Beltane evening. A quality product, traditional in its flavours, what I've come to expect from Sam Adams. I've got the additional bottle which I will age; the malt and fruit notes are there I can feel it, a potential to make this beer brilliant and complex with time. 12oz bottle best by September 2010 (more like best-after). Pours copper brown, red under light, with a HUGE off-white head that leaves a ring and quite a bit of lacing, reduces to a whispy cap and ring. Aroma is bread, toast, caramel, light banana, alcohol, quite bready/malty overall although not that complex. Flavor is caramel malts, toast, banana, a little molasses & brown sugar, some alcohol, some sweetness. Mouthfeel is medium to full bodied, medium carbonation. A solid Old Ale, quite tasty, should get better with time. Pours an amber, slightly ruddy color. Maybe an inch of off-white foam. Smells like a bit of dark fruit ... maybe plums or figs, and more heavily of sweet bready caramel. Mmmmm...pretty decent smell, if a bit straight-forward. I'm not getting the vanilla others note. Not getting the vanilla in the flavor, either. Nor the oak. Nor the nuttiness. What it is a straight-forward, sweet, caramel/malt heavy old ale with a splash of dark fruit and a bit of brown sugariness on the after-taste. Nice, decently chewy mouthfeel. Better by a mile than all of Sam Adams's "regular" lineup. Poured from a 12-ounce bottle into a Saranac pint glass. A: Poured a dark, ruddy amber-red color with brownish highlights and a two-finger head of tan foam. Clarity is a bit muddled and carbonation was ample given its apparent viscosity. S: Smells a bit tart and very fruity, with a little whiff of boozy, sweet alcohol. Raisin, plum and tart citrus fruits surface with very low herbal bitterness. T: Flavor is big, malty and filled with dextrose infused fruits. A lot of raisin, apple and some acidic, tart fruits build around mid palate before the boozy, solid caramel malt finish. Leaves a bit of sediment to chew on in the finish as well. M: Mouthfeel is full bodied, a bit tart and it has a slight alcoholic sting. D: A complex sipper that would be tough to pair with many foods, this Old Ale is very flavorful and might have a nice amongst lambic and barleywine. Although, upon rereading that, it doesn't sound right, but the tart fruit character and higher ABV maltiness lead me to believe it. A- Pours a hazy reddish brown color. A fairly small tan head. Head becomes a few bubbles and leaves almost no lacing. S- Smells is very fruity, bit of alcohol and dark fruits. T- Taste is quite a bit of malts here and darker fruits. Picking up raisins, apples and plums. M- Fuller side of medium in body and lighter side of medium in carbonation. D- Not to bad to drink. Probably my favorite of this years Longshot. Served in my SA Sensory Pint. Best by September 2010 notched on the label. Poured a translucent amber with a one inch, frothy, loose, tan-colored cap that quickly dissipates into a thin, consistent cap. Nose reveals light, fruity esters somewhat reminiscent of grape bubblegum and plums. Taste follows nose - a malty sweet backbone lies behind the light fruitiness upfront. Mouthfeel is medium-light, with an even, mildly assertive carbonation level. Nice brew - not a lot of complexity, but I'd be interested to see how this ages. Best Longshot Series ever IMO. Live review from the 12 oz. bottle that I bought as a part of the "LongShot Series" 6-pack at Reider's in Painesville, Ohio yesterday for $9.99. That local grocery store has quite a few cool beer selections and should be visited by anyone in the area. Notched stamped on the left side of the label is the "enjoy by" date of Sept. 2010. Poured into my Ommegang Witte tumbler. Notes: Congrats to Michael Robinson who created this beer and was one of the winners of the LongShot Homebrew Contest. A: Pours a slightly hazy dark reddish/orange color. A two finger white head forms with really good retention. As the foam gently recedes, sticky spiderweb looking lace is left behind. S: Toasted caramel malt. Light chocolate and dried dark fruits. Some hops in the finish. T: Follows the nose. Toasted and sweet caramel malt. Light dark fruits, and a light bitterness. Though an odd dank metallic flavor lingers. M/D: A medium to full body that is sticky and syrupy. Some hot alcohol makes this a slow sipper. This is a good Old Ale. Simple and enjoyable. This is the best in this years Longshot sixer. Aromas are quite sweet with notes of toffee, caramel, molasses, brown sugar and some dark fruits. Slight hints of alcohol as well. The taste is good, but nothing to write home about. All the expected flavors appear on the palette, but in a much more muddled and one dimensional way, kind of a staple for Sam Adams beers in my opinion. You get the malty sweetness of toffee, caramel, and brown sugar but they aren't distinct and are slightly disjointed. The aroma is far too enticing for the lack of dominant Old Ale flavor I desire. Some notes of dark fruit and a slight alcohol, but don't really add to the overall flavor profile. Also has a slightly dry alcoholic warmth on the finish, while at the same time is a little sticky from either the ABV or the hops but I really can't tell unfortunately. This is a solid all around Old Ale, but nothing spectacular. I wish I could have had the original from the homebrewer because I bet it was much more flavorful and to standard for Old Ales. Good appearance and aroma, and average in all other facets. Still an easily drinkable offering that the brewer can be proud of; heck I wish I won the Long Shot Comp. A: Fluffy 1 finger head fades very slowly over very clear toasty auburn brown color with many bubbles rising up from the etch at the bottom. N: Very malty, with lots of toasty malts, brown sugar, some molasses, little syrupy sweetness, raisin, caramel malts. T: SImilar, with lots of toasty malts on the front. Very sweet, with lots of brown sugar, molasses, crystal malts, raisin, little bitterness perhaps from some hops, a little earthy hop presence, slightly chewy, with some creaminess too. The slightest touch of booze, hides the 9% well. It does taste like it has a little age or oxidation on it. M: Medium with a little syrupy flavor and tons of carbonation, maybe even too much for the style. F: A lingering sweetness, but not as much. SOme syrupy molasses and a little sticky sweetness. It has that lingering aged almost oxidized taste that I get in many aged barleywines. Some raisin and brown sugar at the beginning of the finish but fades quickly to that aged/oxidized taste. All that with a slight bitterness, perhaps could use more bitterness and more hops IMHO. The beer pours a clear amber color with a tan head. The aroma is strong with notes of brown sugar, dark fruit and alcohol. The flavor is similar with a lot of cherries and brown sugar. I also get some caramel malt and the alcohol is very present in the flavor. Medium mouthfeel and medium carbonation. Shellacked cherry wood that is deep rich and clear. The head is off white, starts about one finger high and fades quickly. All that's left is a thin hazy puddle of bubbles floating on a pond of beer. Mine is in the shape of a penguin. The nose is slightly fruity with hints of an earthy woodiness. Caramel scorched grains with a booze note. Not bad but there isn't anything about this beer that makes me want to drink it yet. The taste is much like the nose, a touch of fruity, rum soaked raisin with brown sugar and caramel. Each flavor is slight and doesn't really dominate over another. Smooth mouthfeel with light carbonation and a touch of creaminess. This is a good beer but a little too sweet for my taste. The higher ABV is masked by the sweet flavors and makes this an easy drinking brew. The downside is that it's boring unless you love the style. I find that after a quarter way through I'm looking for something else. A solid beer but only in the average sense of things. 12 oz. A ruby amber pour, maybe a finger of off white head. Very malty, caramel/toffee laden aroma. Some yellow raisin. Taste is equally caramelly. There is a large amount of pale malt I'm guessing, which detracts quite a bit for me. Give it a bit of a bmc twang. It recovers though back to toffee and brown sugar. Just a nip of peat, oak, citrus and pine. Mouthfeel is good medium and quite coating. Carb is good. Drinks all right, though a bit warming. No abv comes through though. Old Ben Ale is a nice-looking beer, a deep slightly cloudy mahogany body with ruby trim; a fat finger of tan froth leaving nice lacing. The smell...hmmm. Honestly, I had to wait until drinking the second Old Ben Ale to properly judge this, for the first time I tried it, I discerned little to no aroma. After the second, I detected mild scents of plum, raisin, and a dash of ginger. Yet the smell is still rather faint and, consequently, disappointing. Ditto with the taste, which is reclusive. The caramel malt is nice and well represented, the dried fruit is present but secondary at best, and hops are scarcely detectable in both taste and texture. The malty mouthfeel is nice, but a bit thin and could use a little more lifting from a hop infusion. I admit to being somewhat spoiled by the spate of downright delicious Old Ales I've had of late--Avery's Hibernation, North Coast's excellent Old Stock, the astounding Curmudgeon from Founders--all of which are first rate in good part because they bring diverse and bold flavors and aromas. Also, the dense malt and richly hopped taste and textures provide excellent balance while being true to the style as malt-forward, malt-rich beers. Old Ben Ale is decent beer, but did not strike me as nearly bold enough to be a front-line Old Ale. A good ale? Yes. A good Old Ale? Not so much. 12-oz bottle poured into a tulip. A = Clear topaz liquid with a firm light tan head of foam that slowly recedes leaving behind a heavy amount of lacing. S = Caramel, toffee, butterscotch, almond syrup, vanilla. A very good smelling English old ale. T = Wow! Rich nutty flavors are the first thing I think when I take a drink, very sweet tastes of caramel, maple fudge, underneath there are some smoky flavors reminiscent if a good Scotch ale, prunes. This is a very good beer. I wish I had more of these to age as it would be interesting to see how it develops over a period of years. M = Full bodied, great mouthcoating, luscious creamy feeling. D = This is just a wonderful beer that I really enjoyed drinking. I think it would be fun to mix it half and half with a nice English bitter so you could enjoy more of the flavor in an evening. Great beer. Poured from a 12oz. bottle into a pint glass. 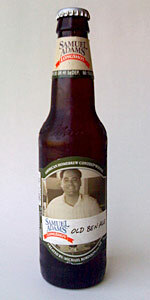 The color is dark amber with about two or three fingers of foamy white head and some nice lacing. The smell is malty with some dark fruit flavor. Some raisin flavor mixed with a little banana comes off just a bit in the aroma. The taste is pretty smooth with nice malt sweetness and a great sweet fruity flavor. There is a bit of bitterness in the flavor and it is a little English in origin. I like the pop that the end seems to have and like the tangy fruit flavor. The feel of this beer is medium bodied and has a nice smooth feel going down. It is a fairly good drinkable beer and has some interesting flavor. Poured into a Duvel glass. Glass of cold water on the side to sip from periodically. Appearance: As poured the beer is a clear dark cherry wood color with a light tan ¾" head that soon recedes to a small ring of foam with an irregular shaped island of a variety of different sizes of bubbles. Both the ring and the island persist for quite a long time. Sipping leaves some light sheets of foam that quickly form into a leggy pattern that clings to the side of the glass. Smell: The aroma is moderately complex with some caramel, brown sugar, dark fruits, and some alcohol. Taste: The nose predicts some of the flavors. There is some caramel and brown sugar. There are also traces of cherries and other dark fruits (raisins? plums?). There is also some alcohol present but it isn't hot or unpleasant (just out of place or too noticable). Mouthfeel: The mouth feel is medium bodied and smooth with abundant fine and persistent carbonation, The finish is long and begins sweet, remaining so for a good while. Gradually the finish dries out and spreads through out the back of the palate with a touch of tartness and bitterness. Drinkability: The beer is pleasant enough to drink and seems a reasonably well made old ale but the balance of flavors seems slightly off somehow. While I'll be happy to drink the other bottles I have of this one, I also won't be upset when they are gone.